Yesterday I was painting a mural on a wall at a local school. In the evening I was talking to my husband Matt and I was saying that because the picture is so big, as you are designing and painting it on the wall, you have to keep stepping back to get a better perspective. When you are next to the wall, drawing or painting, you lack the ability to see the bigger picture. You can’t quite see if something is straight or big enough or if it fits together ok with the rest. So you have to keep stepping back to take it all in and see how everything is fitting together. When you are close to the details you can’t see the bigger picture. Perspective is so important in life. Perspective often dictates our response to situations. Perspective is often limited to our view of the details in front of us. For instance, if I have a critical or negative perspective about something or someone, I will tend to see everything from that perspective. Even if something good happens or the person does something good, I will often not see it, because I will only see what was wrong. Unfortunately, I will also communicate to others from that perspective, meaning that they too are now being influenced by my limited negative and critical perspective. On the other side of the spectrum, when you love someone you should have the opposite perspective. (We often use the old ‘rose tinted glasses’ saying to describe seeing things from a rosy perspective when we are overly positive or especially when we are in love!) When you love someone you see them and what they do through different eyes. You demonstrate compassion and understanding. You choose to see more from their perspective rather than just your own. Because love is primarily about sacrificing your selfishness for another. Which means thinking less of yourself and more about them. So much of what we do is connected to our attitude and perspective. How we choose to ‘see’ affects so much of what we do. Sometimes we can become so consumed with our day to day lives, struggles and priorities that we can lose the bigger picture. We are so focused on ourselves and what we need to do that we become blinded to the challenges that others face, which in turn means we can lack empathy and understanding. Renewed hope, purpose & vision. Often it’s not until a traumatic change takes place in our lives that we really ‘value’ the normality of our everyday lives. It’s not until we lose something or somebody that we realise that we maybe valued the wrong things. It’s all linked to perspective. However… we don’t need to wait until something bad happens to us or someone close to us to change our perspective. We can choose to do it now. Sometimes we do not need a major change in our lives. Instead we have to choose to see things differently. Sometimes we need to see life and the people who surround us with ‘new eyes’. Maybe we need to open our eyes to a new way of thinking and a new way of relating to the world. It’s then we realise that our problem was not really the circumstances of our lives but was instead our limited perspective and view of it. 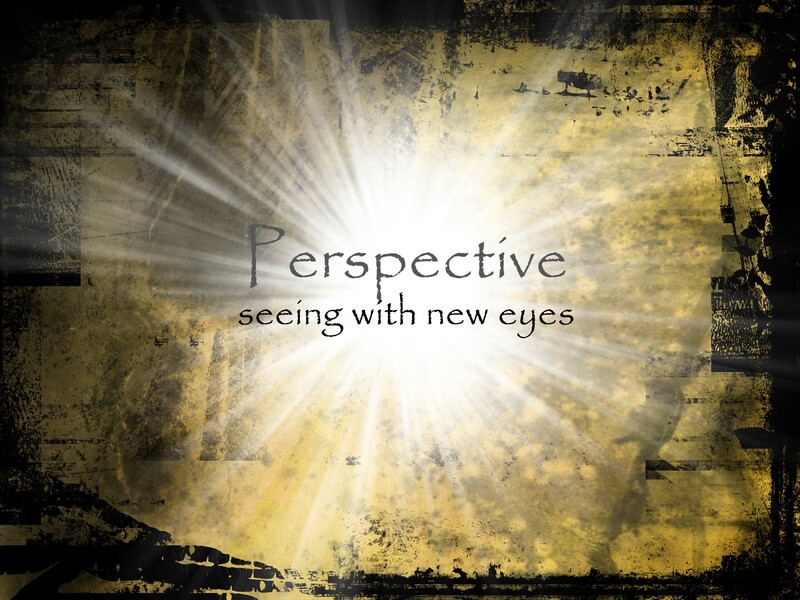 What will our lives look like if we choose to ‘open our eyes’ to a new perspective? Previous PostWho am I…. Really? Embracing our uniqueness in a world full of labels.Next PostA Year Ago Today: A journey through grief and what I have learnt.